Attending the Foreshore Forum last December at the Society of Antiquaries, one of the presentations stirred my inner techie with its talk about photogrammetry. 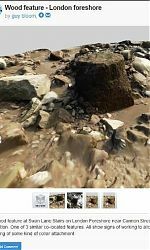 With a little time on my hands last week I revisited the topic and I thought the outcome was worth sharing with anyone else interested in capturing foreshore feature (or other) images in 3D. My criteria was for a simple solution requiring little knowledge, didn’t require me to use multiple software packages and didn’t tie-up my PC for hours processing data. With a quick search on the net I found a package called Autodesk 123D Catch which appeared promising. As a bonus there was a free app for my phone too. 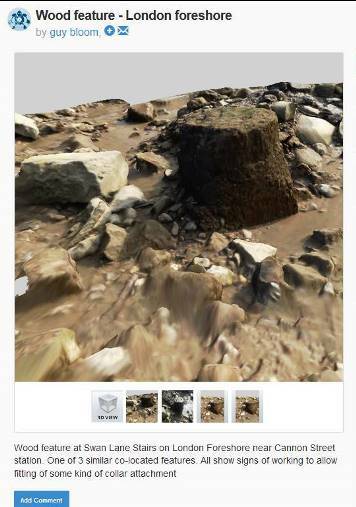 The app works by uploading images, processing and storing the 3D images in the ‘cloud’. So I downloaded the app, found an unwitting subject in my cat and 15 minutes later had a 3D mage on my phone. Simple!! You can see a screenshot of the 3D image above. The next day on the foreshore at Cannon Street I did another test on a small timber feature. To save my mobile bandwidth I used the Wi-Fi in a well-known coffee shop while we enjoyed a post trip drink to upload the images, and by the time we had finished I had the final image 3D on my phone. See it here and use your mouse to zoom, pan and tilt the image. You can see other people’s images here. Taking the photos to enable a 3D image to be produced is relatively simple – it requires 30-40 overlapping mages circling the subject. You can also use a camera connected to a PC software package for uploading. So in summary, the upside is that someone else does the hard work of meshing and storing the images. The downside is that the images are not quite the same quality as laser imaging but are still a reasonable quality – and free. 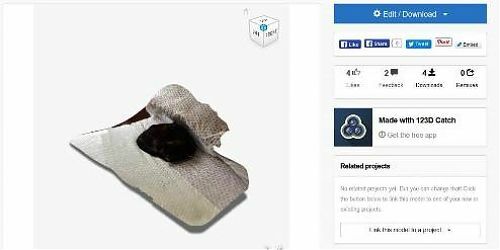 Other considerations include editing the 3D images is less straight forward than the capture, you do not have sole use of the image and creation of a web-based community of images. I hope this of interest. If you would like any more information just contact me. I would also be interested if anyone else has experience and recommends other solutions. It’s simple and fun! Give it a go and let us know what you think.